One of Franklin's electricity letters. This Benjamin Franklin letter is from a series of letters he wrote about his studies of electricity. Franklin sent his observations in a series of letters to Peter Collinson of London and to others. Collinson was a member of the Royal Society, an organization which encouraged study in the sciences. 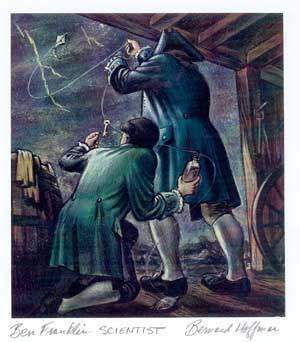 Collinson understood the importance of Franklin's discoveries and had the letters published in a book called "Experiments and Observations on Electricity Made at Philadelphia in America" so others could learn from them. This book was so popular that it became the most reproduced book of the eighteenth century, making Franklin famous in Europe and America. In this particular letter, Franklin tells Collinson that he is so involved in his electrical studies that he hardly has time for anything else. He also tells Collinson he will keep him up to date with any observations he makes. You can read the complete series of letters at our Benjamin Franklin and Electricity page. Your kind present of an electric tube, with directions for using it, has put several of us on making electrical experiments, in which we have observed some particular phaenomena that we look upon to be new. I shall, therefore communicate them to you in my next, though possibly they may not be new to you, as among the numbers daily employed in those experiments on your side the water, 'tis probable some one or other has hit on the same observations. For my own part, I never was before engaged in any study that so totally engrossed my attention and my time as this has lately done; for what with making experiments when I can be alone, and repeating them to my Friends and Acquaintance, who, from the novelty of the thing, come continually in crouds to see them, I have, during some months past, had little leisure for any thing else. I am, &c.